The meerkat, or suricate, is a small mammal and a member of the mongoose family. Meerkats live in southern parts of Africa which is dominated by the Kalahari desert. The Kalahari desert has little rainfall and an arid climate with open plains. It spreads across the Southern part of Africa covering over one million square miles and is 10 times the size of Great Britain. The land is covered by a porous or soft sand that in many places is bright orange color. A group of meerkats is called a "mob" or "gang". Meerkats are small, day-active herpestids. Their tail, which is not bushy like all other mongoose species, is long and thin and tapers to a pointed tip which is black or reddish colored. Meerkats will use their tails to balance when standing vertical. Their faces taper, coming to a point at the nose which is brown. Meerkats' eyes always have black patches surrounding them. They have small, black, crescent-shaped ears that have the ability to close when digging to prevent sand entering. Meerkats have strong, curved claws used for digging for prey and altering their underground burrows. They have four toes on each foot and long, slender limbs. The color of the coat is usually fawn peppered with gray, tan, or brown with a silver tint. They have short, parallel stripes across their backs; these extend from the base of the tail to the shoulders and are unique to each animal. The underside of the meerkat has no markings, but instead a patch on their belly which is only sparsely covered in hair and shows the black skin underneath. The meerkat uses this area on its belly to absorb heat when it stands on its rear legs, which is usually done first thing in the morning to warm up after cold desert nights. Meerkats are burrowing animals, living in large underground networks with multiple entrances which they leave only during the day. They are very social, living in colonies of up to forty. Animals from within the same group will groom each other to strengthen social bonds. The alpha pair will often scent mark subordinates of the group to express their authority, and such actions are usually followed by the subordinates licking the faces of, and grooming, the alphas. These actions are also practiced when members of the group are reunited after a short period apart. Most meerkats within the same group are all siblings and offspring of the alpha pair. Meerkats demonstrate altruistic behavior within their colonies. One or more meerkats will stand sentry (lookout) while other members are foraging or playing in order to warn them of approaching dangers. 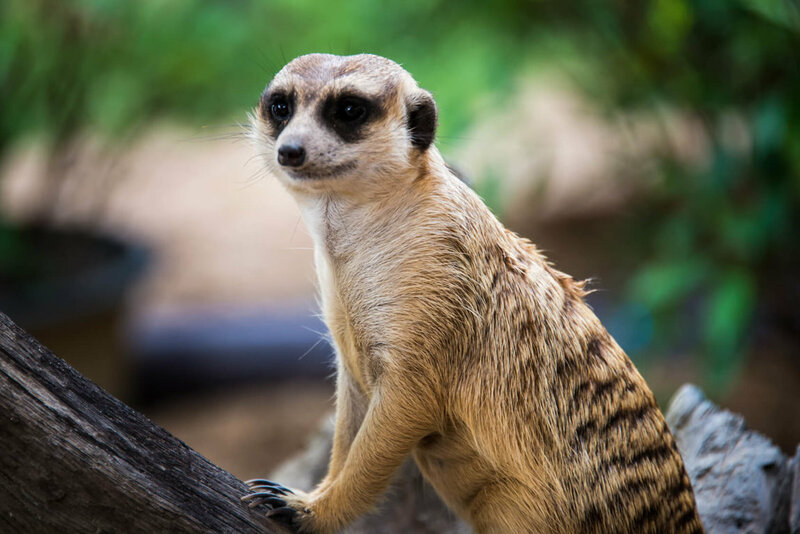 When a predator is spotted, the meerkat performing as sentry will give a warning bark, and all other members of the gang will run and hide in one of the many bolt holes the meerkats have spread across their territory. The sentry meerkat will be the first to reappear from the burrow and search for predators, constantly barking to keep the others underground. If there is no threat, the sentry meerkat will stop barking and the others know it is safe to emerge. The meerkat's diet is mainly insectivorous, but they will also consume lizards, snakes, spiders, plants, eggs and small mammals. Like all mongoose species, the meerkat has developed an immunity to many venoms. This allows them to eat scorpions (including the stinger) and some snakes without fear of illness, poison or death. They have no fat stores, so if they don't forage for food every day they will die. Meerkats become sexually mature at about one year of age and have, on average, three young per litter. The wild meerkat will have up to three litters a year. Meerkats can reproduce any time of the year, but most births occur in the warmer seasons. The male will fight with the female until she submits to him and copulation will begin. Gestation lasts approximately eleven weeks and the young are born within the underground burrow and are helpless at birth. The young's ears will open at about 10 days of age, and eyes at 10-14 days; they are weaned between 49 and 63 days. They will not come above ground until at least three weeks of age and will stay with babysitters near the burrow. It will be another week or so until they join the adults on a foraging party. Usually, the alpha pair reserve the right to mate and will normally kill any young not their own to ensure that their offspring has the best chance of survival. They may also exile or kill the mothers of the offending offspring. Meerkats will babysit any young that may be in the group. Females that have never produced offspring of their own will lactate to feed the alpha pair's young while the dominant female is away with the rest of the group. They will also protect the young from any threat, often endangering their own lives to do so. On warning of a danger, the babysitter will either take the young underground to safety and be prepared to defend them if the danger is able to follow, or collect all young together and lie on top of them if retreating underground is not possible. Meerkats are known to engage in social activities, including what appear to be wrestling matches and foot races. They have their own language, with specific calls alerting to the approach of snakes, birds of prey, or other predators. They engage in singing ceremonies similar to yodelling. Meerkats make poor "pets". They are wild animals, not domesticated animals. Wild animals belong in the wild. Confining them to captivity is cruel. Most pet meerkats are taken from the wild illegally in a cruel manner, caught in traps that make movement limited or cause inescapable pain. Meerkats don't breed well in captivity. For every captive bred meerkat that survives, many die. Females often abort or eat their own babies. Meerkats are immensely sociable with their own species, living in groups of over 12 animals, and do not fair well in solitary confinement. Living alone can cause severe stress, sometimes to the point of self-harm. Their digging instincts will lead to torn furniture, uprooted plants and ripped carpets. They scent-mark their property; smearing unpleasant smelling odors throughout the house. Being wild creatures, meerkats will unexpectedly bite or scratch, either out of fear, frustration, playfulness or simply boredom. They can carry rabies. They generally dislike being handled or pet, and are considered dangerous around curious young children. Meerkats have a very varied diet consisting of insects, scorpions, spiders, millipedes, larvae, worms, rodents, eggs, small birds and small snakes. These dietary needs can never be met in captivity. They are territorial and stubborn. They will fiercely defend their patch against larger animals, which can lead to serious injuries to meerkats and other companion animals. They are vulnerable to disease, which they can catch from other companion animals. Meerkats are one of the most popular zoo species because of their activity level. Some of the most irresponsible zoos even allow visitors to touch, hold and feed the animals. Confined to tiny spaces and denied a natural life for the sake of human entertainment, captivity is cruel for meerkats. Wild animals in exhibits and acts endure constant stress. Their immune systems are weakened and they become prone to sickness. Many resort to self-mutilation in reaction to stress or boredom. Mental illness is rampant among confined animals. Torn from their families and deprived of all dignity, every part of their lives is controlled by their captors.